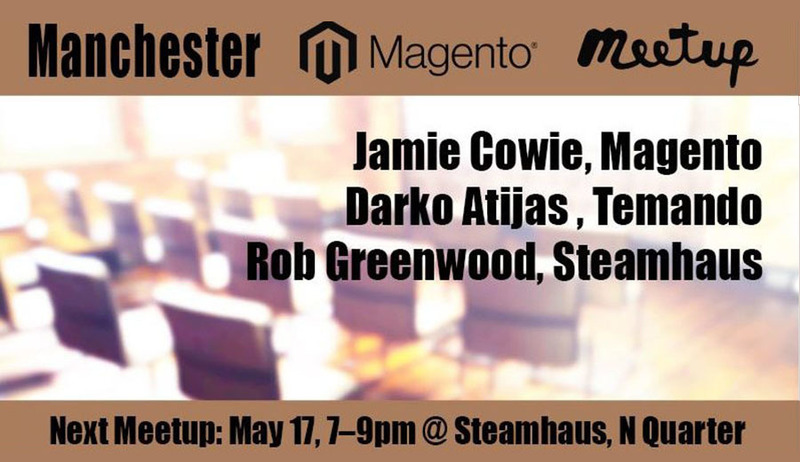 We’re all set for our next Magento Meetup to be held on 17 May at Steamhaus in Manchester’s Northern Quarter. After the success of our March event we’re delighted to stay at the venue which proved perfect for the size and nature of the event. The lineup of speakers is almost confirmed, but people come just as much to meet other developers and retailers as they do for the expertise. Places are already being taken, so if you’re interested we urge you to book your place quickly. And remember, the event is free, and that includes drinks and pizza for all. Jamie Cowie of Magento, who will be talking about the platform’s new developments and taking Q&As from guests. Darko Atijas of multi-carrier shipping platform Temando will be presenting a talk entitled “What’s the big deal with shipping?” that will uncover some fascinating new figures from Temando-commissioned research into the fulfilment sector, as well as introducing the company’s Magento-based solution. Rob Greenwood of cloud hosting (and tonight’s Meetup hosting) company Steamhaus, who will be talking about the benefits of hosting Magento in the cloud (benefits that are powerful enough for Steamhaus to uproot themselves from traditional hosting and set themselves up in the sector). There aren’t many places left, so please book now to secure your attendance at the event. As places are far outstripped by demand, we do ask that you cancel your attendance if you’re unable to come on the night. For that reason we urge people to book a place even if it’s full – a few drop-outs are almost inevitable. And finally, a work on recruiters. Magento Meetups are not designed to be jobs fairs – it’s an industry event for the sharing of knowledge in a specialised sector. If you want to make contact with potential recruits, please use other channels. You and your company will be permanently blacklisted from future Meetups if you are found to be piggybacking on it for recruitment purposes. Genuine guests would expect nothing less. Get the latest ecommerce news direct to your inbox from PushON!